Celtic Crown Video Slot Guide & Review - Casino Answers! Celtic Crown is a 5-reel, 25-line video slot developed by Microgaming, featuring wild substitutes, scatter wins, a gamble feature, a free spins feature and a bonus game. You can play the Celtic Crown video slot at Ladbrokes Casino and Grand Hotel Casino. To play Celtic Crown, your choices for the coin value are $0.01, $0.02, $0.05, $0.10, $0.20 and $0.25. Then, you can choose how many paylines (up to 25) and coins (up to 20) you wish to play. The minimum bet you can make on Celtic Crown is $0.01 all the way up to the maximum bet of $125 per spin. To play all 25 paylines and 20 coins, use the “Bet Max” button. If you wish to play with your own wagering settings, you can set them and then use the “Spin” button. The top jackpot symbol on Celtic Crown is the King. 5 King symbols will win you 10,000X your bet per line. The second highest is the Swords and Shield symbol at 1500X. 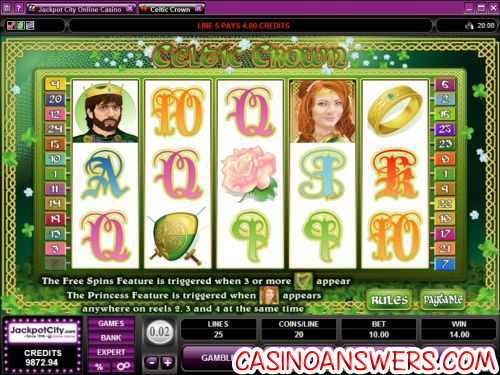 When three or more Scattered Harp symbols appear on the reels, you will trigger the free spins feature on Celtic Crown. Each of these symbols will reveal a number. The numbers will be added up and that’s how many free spins you will win. You will also receive a 2X multiplier, so all of your winnings will be doubled. The free spins feature can be re-triggered. The free spins will be played at the paylines and bet of the triggering spin. The Princess symbol is the wild symbol. It will only appear on the second, third and fourth reels. It substitutes for all other symbols in Celtic Crown except for the Scattered Harp symbol. When the Princess symbol appears on all 3 of the reels, you will trigger the Princess bonus game. There will be 6 Knights with prizes for the Princess. You will be able to choose any three of them. All prizes are multiplied by the triggering bet. 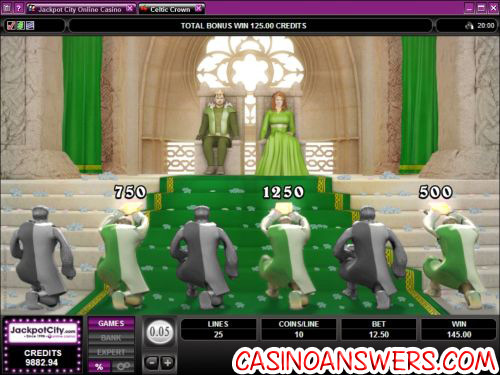 The Princess bonus game feature can be triggered during the free spins feature. Here is a screenshot of the Princess bonus game. After any win your receive on the Celtic Crown slot machine, you can hit the gamble feature to launch the gamble feature to double or quadruple your win. To double your winnings, you must predict the colour of the face down card correctly. To quadruple your winnings, you must predict the suit of the card correctly. Previous card history will be shown at the bottom. You may back out of the gamble feature at any time by using the “Collect” button. Hit the “Expert” button to access Celtic Crown’s autoplay mode. Here you will have 10X and 5X quick autoplay spin buttons or you can hit the “Auto Play” button for advanced settings. In the advanced settings, you will be able to set the number of spins at 5, 10, 25, 50, 100, 250 or 500 and to stop if a win exceeds or equals $100, $500, $1000, $5000 or $9999. You can cancel the Celtic Crown video slot’s autoplay mode at any time. If you’re looking for a great online casino to play Celtic Crown at, you can get a 100% signup bonus up to $100 when you register and make your first deposit at Ladbrokes Casino! Can American gamblers play Celtic Crown for real money? USA casino players are out of luck when it comes to finding an online casino to play Celtic Crown at. Microgaming-powered casinos are not accepting players based in the United States at this time. For an excellent Irish-themed video slot that US players can play for real money, please read our Shamrock Isle Video Slot Review. Can I get a no deposit bonus to try the Celtic Crown slot out? Sure, if you’re not ready to make your deposit yet but you still want to play for real money, you can sign up at Grand Hotel Casino and they will give you a $10 no deposit free cash bonus to try their casino games like Celtic Crown out. If you decide to make a deposit, you will receive a 100% up to $150 signup bonus. What casinos have Celtic Slots?